Credit Agricole has been present in Ukraine for 25 years. How has the bank’s footprint in Ukraine evolved over this period? We have gone from a bank of one hundred people specializing in international companies to a full-service universal bank operating throughout the Ukrainian market. This evolution took place step by step and was the result of a gradual consolidation of our activities in this country. The first step was the opening in 1993 of a Ukrainian subsidiary of Credit Lyonnais specializing in large international companies. This subsidiary was integrated into Credit Agricole Group after the acquisition of Credit Lyonnais in 2001. Further growth came with the 2006 purchase of Index Bank retail bank, with a name change to Credit Agricole Bank in 2011. One year later, all of the group’s banks in Ukraine were merged into a single receptacle operating under the Credit Agricole brand. Today we are the oldest foreign bank operating in the country. For the record, it should also be noted that Credit Lyonnais actually opened its first branch in Odesa in 1892, so our corporate footprint in Ukraine goes back a lot further than 25 years! We currently have 155 outlets throughout the country and a total balance of over UAH 33 billion. We employ more than 2,300 people and have around half a million customers on our books. Credit Agricole has the highest rating from Fitch among banks operating in Ukraine and we are ranked among the country’s top five most profitable banks. What do you regard as the most significant achievements of Credit Agricole in Ukraine over the past 25 years? Without any doubt, I would point to the merger of our activities into a unique bank. This complex merger took place very efficiently and allowed us to profit from the complementarity that existed between a retail bank and a corporate and investment bank focusing primarily on big corporate clients. This made it possible for the Credit Agricole Group to become an important player in the Ukrainian banking market, covering all customer segments and offering a range of complex banking services. The numbers speak for themselves: thanks to this merger, we are now the number ten bank in Ukraine in terms of assets, with an 8% share of agro loans and a leadership position of 45% in the car financing sector. The bank has around 1,100 international corporate clients, 1,500 mid-corporate in Ukraine and 18,000 SMEs as well as over 300,000 private active customers. We are also among the top three banks in Ukraine in terms of FX markets. 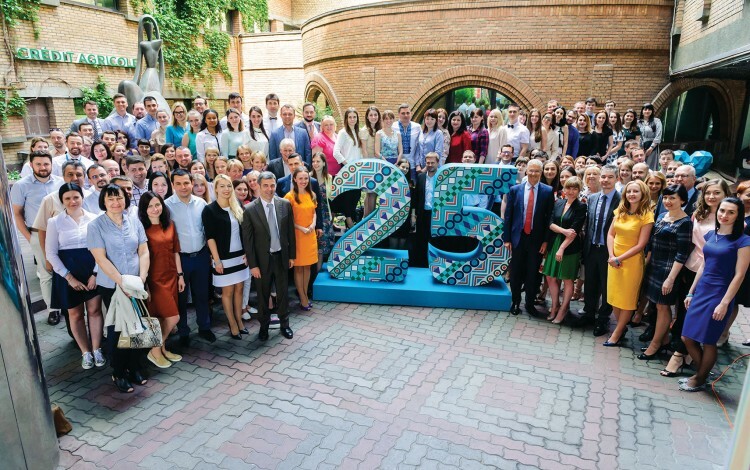 As you look towards the next 25 years, what excites you most about the Ukrainian banking market? Looking ahead, the Ukrainian banking system must be ready to evolve dynamically in order to meet the challenges of the fast-changing economic and social environment around us. One of the key ongoing themes of this evolution will be digitalization, which will remain at the center of the industry. Ukraine’s banking sector will need to develop a more sophisticated range of services to meet the growing needs of the country, including areas like insurance, asset management and structured products. Responsiveness will also be vital, with customers expecting ever more rapid responses and unhindered decision-making. This will be particularly important as banks face growing competition from new operators providing online services. Tariffs and their composition will have to be reviewed as pricing becomes an increasingly important factor. As the expectations of clients grow, the quality of services will also improve. The relationship between banks and their customers will undergo dramatic change, with banks rethinking the balance between branches and online contact centers. I remain convinced that there will be a continuing role for branches, but this role will evolve to focus more on face to face expert interaction rather than routine banking functionality. In short, the challenges facing the industry are colossal and exciting. They will demand dynamic engagement. You have personally been working in your current post since 2014. What do you regard as the key milestones in the Ukrainian banking industry since you arrived in the country? I can confirm from my own experience that the Ukrainian banking sector has undergone major changes during the last three years as a result of the courageous and decisive actions of the National Bank of Ukraine (NBU). This reform process has not been easy but it has been well handled. The NBU has succeeded in implementing a policy of proactive restructuring of the banking system. This has included obliging banks to pass stress tests and to recapitalize in order to have solvency ratios more in line with international standards. In parallel, new rules have been put in place to help the fight against money laundering and in support of better banking ethics in general. In addition to these reforms, the NBU decision to nationalize the country’s largest private sector bank PrivatBank in 2016 was a welcome move. Due to the size of the bank, it posed a systemic risk to the entire Ukrainian banking system. The nationalization of PrivatBank sent a clear message to all Ukrainian banks that the rules of the game had changed and everybody would have to respect these new rules. As a result of these measures, the Ukrainian banking sector is definitely much stronger today than it was three years ago. It has become profitable, it is better managed, and it is better able to support the development of the Ukrainian economy. We now see banks in Ukraine operating more in line with international standards. The entire process has sent a very positive signal to the international business community. How does the evolution of the Ukrainian banking sector compare with developments in other former post-Soviet and Eastern Bloc countries? Generally speaking, the evolution of the Ukrainian banking sector is moving in the right direction. As I spent five years in Poland I can see some areas where the Ukrainian and Polish markets could be considered suitable for useful comparison, but there are also many major differences. One example would be the number of banks. Even after the closure in recent years of approximately one hundred banks in Ukraine, there are still around 80 banks active in the country, whereas the figure for Poland is closer to 30. There is also a very high concentration of state-owned banks in the Ukrainian banking sector, with the state owning around 55% of all banking assets at present. This should evolve to ensure a more competitive balance. The overall condition of the Ukrainian banking sector remains fragile compared to that of neighboring countries, with low profitability and very high levels of nonperforming loans. The products available to retail customers are also less complex than the selection you will encounter elsewhere in the region. The Ukrainian banking sector has witnessed some of the most radical reform measures in the country since 2014. What are the remaining reform priorities for the sector for the coming years? It is crucial for the NBU to maintain the current dynamic of reforms and not to allow the process to stop. This also means preserving the independence of the NBU itself. It is necessary to continue to strengthen the solidity of the market by obliging banks to pass stress tests on a regular basis. Measures must continue to ensure good governance, viable business models and effective risk management. Implementation of the new Supervisory Review and Evaluation Process (SREP) based on European standards will aid this process. Another key point is greater support for the lending market. The protection of creditor rights should be a top priority but this is not yet always the case. Even when banks secure a court decision in their favor, it can sometimes be quite difficult in practice to recover debts. This acts as a constraint on the development of the Ukrainian banking sector and it serves to inhibit lending.